1. “Safety Town” is a collaboration of UW Health/American Family Children’s Hospital, the Madison Fire Department, and MPD. This is a program designed for children entering kindergarten in the fall which teaches children how to be safe in their community. Safety Town uses hands-on activities – taught in a small-scale city with streets, homes and sidewalks – to teach children about many different aspects of safety and injury prevention. Safety Topics include: Bicycle, electrical, animal, fire, playground, school bus, traffic, water, poison, weather and pedestrian safety. 2017 Safety Town Dates: Session 1: June 12-16, Session 2: June 19-23, Session 3: July 10-14 and Session 4: July 17-21. Sessions are held 8:30-11:30 each day of the week. 2. “CampHERO” is an exciting experience designed to help girls develop courage, gain confidence and build character while introducing them to the protective services. 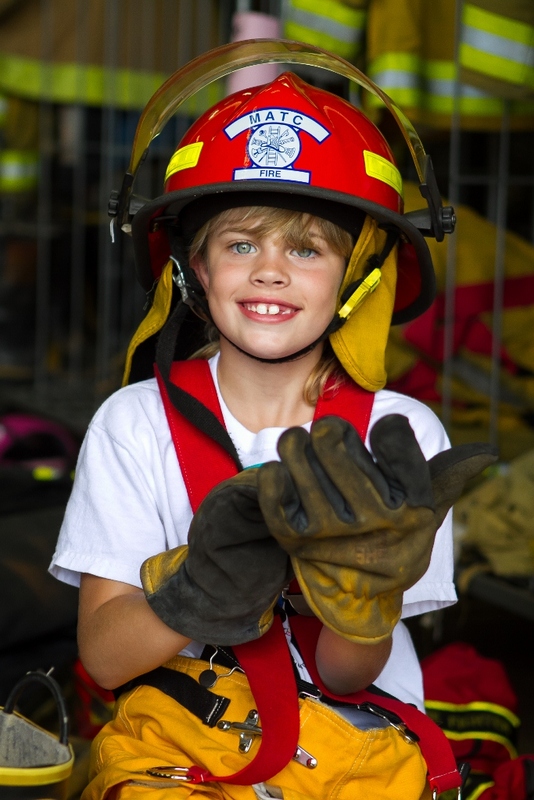 A collaboration of the Girl Scouts of Wisconsin Badgerland, the Madison Fire Department, and MPD, this initiative gets girls to explore their interests and skills through hands-on activities, taught by real police officers, firefighters, EMT/paramedics, and dispatchers. CampHERO curriculum was designed by professionals in the protective services with guidance by Girl Scouts, the experts in leadership experiences for girls. The program is safe, hands-on and age appropriate. 2017 Dates: K-1st Grade July 29, 2-3rd Grades July 22, 4-5th Grades July 20-21, 6-8th Grades July 16-19, 9-12th Grades July 23-28. Fees vary depending on the grade level. Financial assistance is available. 3. “Sporting Events at Leopold Elementary School” is a flag football and baseball program which is organized through the YMCA. This will take place on Tuesdays and Thursdays at the school from 4:30-5:30pm. It will start in mid-June through the first week of August. There is no cost to attend. Food and drinks will be provided to the children. 4. “Terrific Tuesdays” will take place in conjunction with Lakeview Library (2845 N. Sherman Avenue). This program will be held weekly from 4-5pm. We have two officers scheduled to appear on May 2, May 23, July 25 and August 1st. Various hands-on learning and building projects such as Flags of the Nation, constructing mobiles, space science, etc. This is a free drop-in program. 5. “Neighborhood Kickball Challenge Series” is a three week tournament scheduled for June 20, June 27 and July 11 at Warner Parker. The round robin is intended for middle-schoolers from the Brentwood, Northport, Packers and Woodland Park neighborhoods. Final details are still being worked on. 6. “Rocket Club” is tentatively scheduled for June 19, June 26, July 17, July 24 and July 31st at the Vera Court Neighborhood Center from 10:30am to 12pm. The club is intended for middle-schoolers in the Vera Court Community Center service area. The five week program teaches astronomy, basic rocket science and model rocket building skills. The program culminates in launching of the kids home built rockets. 7. “Little Free Library/Spring BBQ” takes place at Owl Creek Park on May 20th from 12-2pm. This event is taking place with the collaboration with Sennett Middle School. This event is to dedicate the Little Free Library to this location. 8. “Black Youth Academy and Latino Youth Academy” are hugely popular programs offered each summer by MPD and a host of other law enforcement agencies, community-based organizations, and volunteers. These are week-long academies open to all youth, but primarily focus on building relationships with youth of color. The two academies are geared toward incoming 8th graders from the greater Madison area and is free to attend! (breakfast/lunch provided, transportation assistance, and a graduation party on Friday night). Students learn more about the role and work of police and first responders while also building relationships of trust. Topics included in our youth academies include: driver simulator, fitness, community discussions, financial responsibilities, leadership/followership, building clears, interview & interrogations, CPR & First Aid, CSI, use of force topics, traffic stops and cyber investigations. 2017 Dates: August 7-11 (8a-4p) – Black Youth Academy. August 21-25 (8a-4p) – Latino Youth Academy. For more information contact us at core@cityofmadison.com or 608-267-1965. 9. “MSCR/MMSD After-Summer School Programs” – Our MPD CORE team is hoping to again assist with programming at several Madison area middle schools, location yet to be determined. The program is M-F from 12-4pm and follows the MMSD summer school schedule. Some activities include but are not limited to: sports, reading, cooking, art and crafts, a mini police academy, and fishing. 10. “West Side Boxing Club” is held at Elver Park Neighborhood Center and is suited for 4th-12th grade youth. 4-7th grade youth meet at 4:15-5:15pm on Tuesday and Thursdays. 8th-12th grade youth meet at 5:30-6:30pm on Tuesdays and Thursdays. The fee to attend is $68 dollars for the year. Financial assistance is available. This program is currently already underway. For more information contact Police Officer Justin Nelsen at 608-279-3164 or stop by the Elver Park Neighborhood Center. The West Side Boxing Club is collaboration between the Bob Lynch Boxing Foundation, Madison Police Department and Elver Park Neighborhood Center. 11. “Madison Police Explorer Post 911” is a hands-on program open to young men and women who are interested in a career in policing or a related field in the criminal justice program. Eligibility is open to 14 year olds (and have completed 8th grade) through 20 years of age. Must demonstrate a minimum grade point average (GPA) of 2.0. Police Exploring offers young adults a personal awareness of the criminal justice system through training, practical experiences, competition, volunteer/charitable work opportunities, and other activities. This program meets two Sundays/month from 5:45pm-9:00pm at the Madison Police Training Center (5702 Femrite Drive). 12. “Free Movie Series – Walk In Bike In Theatre” will take place on May 12, May 19 and May 26. Movies for younger children will start at 6pm inside the Bayview Foundation Community Center located at 601 Bayview. The outdoor movies chosen for middle school and older children will start at sunset in the greenspace located at 755 Braxton Place. The series of movies is funded through the Madison Community Policing Foundation and supported by the Bayview Foundation and Badger Popcorn. 13. “Southside Soccer Series” returns again this year! This year the soccer series will be held at Leopold Elementary School (2602 Post Road). Dates are: July 8, July 15 and July 22. Registration starts at 10am. Games start at 10:30am and will wrap up around 2pm. Lunch is included, chance for prizes and a trip to see Chicago Fire play are also involved. For more information contact Amigos en Azul at 608-209-2403. 14. “Police Club” through the Allied Drive Learning Center Summer Program takes place throughout the summer. Below is an itinerary of the dates and topics we have scheduled. Timing for each session is 2-3pm and they are held at Marlborough Park on the west side of Madison. This program is dedication to children already registered with the Allied Drive Learning Center Summer Program (through the Madison School District/MSCR). The cost is free to attend. The age group that attends is primarily 10-13 years of age. For more information contact Laura Harrington with the Allied Drive Learning Center at 608-204-6578. 15. “Friday nights at the Y” – MPD has once again partnered with the YMCA of Dane County for Friday nights at the Y. All summer long, teens ages 13-18 can visit any Dane County YMCA for fun activities on Friday nights. No Membership is required! The program runs June 2nd- August 25th from 8p-11:30pm at the Lussier Family East YMCA, Lussier Family West YMCA, and the Northeast YMCA. Please note that this represents only some of the more formalized programs that involve MPD and collaborative community partners. Each District has a number of other outreach initiatives that are unique to the area served. Please consult your District-area blog for more specific events and opportunities that may be of interest.